Each Sunday at StuckatTheAirport.com we take a look at some of the fun and inexpensive souvenirs you can find at airport gift shops. This week’s treats come from Mineta San Jose International Airport (SJC), which just opened its new high-tech Terminal B to the public. At SJC, there’s free wireless Internet access throughout the terminals, but in the new Terminal B, 25% of the seats are equipped with AC outlets and USB ports. So re-charging your electronics shouldn’t be a problem. But when you plug in, pay attention: I thought I was charging up my cell-phone only to look down a half hour later and discover that I was plugged into a bank of chairs that wasn’t ‘turned on’ yet. But let’s get back to Souvenir Sunday. 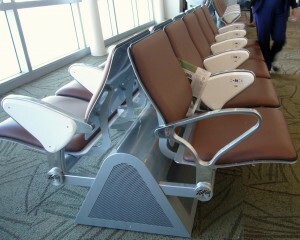 I spent last Wednesday – the entire day – touring the new Terminal B at San Jose Airport. So I had plenty of time to poke around. 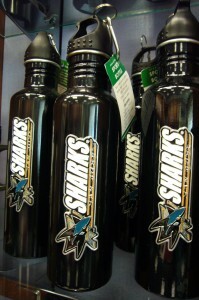 In the San Jose store, which promises local souvenirs and memorabilia, I found shirts, caps, and water bottles branded with the San Jose Sharks hockey team logo, but all that stuff was more than $10. The recycled motherboard notebooks and cute little frames made out of recycled keyboard letters seemed very Silicon Valley, but a store clerk said she was pretty sure those items were all made in China. Moving on, I found a branch of C.J. 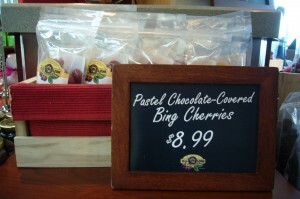 Olson Cherries. For more than 100 years, this family-owned farm has been growing cherries and operating a fruit stand in Sunnyvale, which looks to be about a 15 minute drive from the San Jose Airport. The airport shop is small, but it sells fresh cherries and other fresh fruit as well as dried fruits, nuts, fruit-flavored candies and cherry accessories. For my Souvenir Sunday pick, I got a small container of fresh cherries. The cherry-themed apron fell outside my $10 Souvenir Sunday limit, but I found a plenty of cherry-flavored treats that fell well within my budget. Have you found a great souvenir while you were stuck at the airport? If it cost around $10, is “of” the city or region and is, ideally, a bit offbeat, please snap a photo and send it along. Your photo may end up featured on a future edition of Souvenir Sunday. And if it is, I’ll send you a special souvenir.